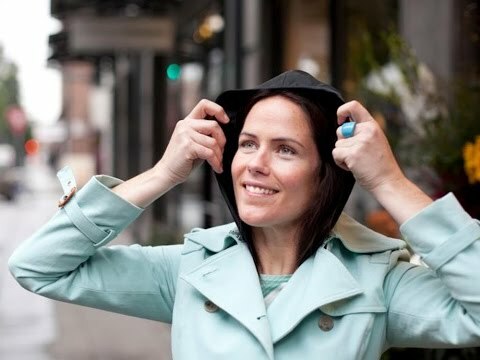 Hood To Go is a portable rain hood attached to a small, lightweight vest that can be worn under any jacket, allowing you to stay dry and protect yourself from the elements. It comes in a convenient pouch that can fit in your bag, pocket, or glove compartment. Dimensions (in packaging): 6" x 4" x 1"
Used it once so far. Comfortable, light, and did the job. My aunt loved this Hood To Go! She sometimes delivers flowers at the florist she works at part-time and now she will not be left out in the rain. I was very pleased at the quality of this product. It's made well and fits on my head snugly and covers it well. I love the fact you can just stash it in a purse. And it really doesn't interfere with whatever you're wearing, especially if it's a lightweight jacket. Rain happens, but that’s no reason to get yourself in a frizzy tizzy. Just put on your Hood To Go and brave the elements without compromising your plans. This water-resistant rain hood is attached to a small, lightweight vest designed to fit under any jacket to protect you from passing showers. It's as good for your commute as it is for your outdoor exercise routine. No need to tote an umbrella or wear bulky rain gear just because the sky looks gray. Simply stow this modern day rain bonnet in your pocket or purse and you’ll be ready for Mother Nature’s unpredictability on a moment’s notice. Growing up in Portland, Oregon, Hood To Go founder, Susan Hammel, was no stranger to unexpected changes in the weather. If she had worn a raincoat every time the forecast called for a chance of showers, her mood would have been as gloomy as the weather. Now when it starts to sprinkle, Susan reaches for her Hood To Go and her hair (not to mention her outfit) is no worse for the wear.